Let Your Samurai Flowers Bloom! Seed your dreams and ideas with your samurai mind notebook. Yesterday, I had a curious experience. I was doing a six-month review of a samurai notebook. In the notebook, I was beginning to imagine how I want to reconstruct my work experience and life. The shocking thing is that six months later a lot of these things are starting to become true. Just this week I learned that I am one of 15 lucky New York City teachers who will get a scholarship to take courses at the Library Sciences program at Syracuse University to become School Media Specialists. I am going to become a 21st century samurai librarian! This move is a mash-up of both my work with What Color is Your Parachute and my samurai notebook. With the help of Parachute I did an inner search for my interests, abilities, and desired working conditions. As I did my process and finally created my What Color is Your Parachute (WCIYP) “flower,” I made sure that I placed a lot of my searching and results in my samurai notebook. Because of this, I kept running into my requirements for different work or training. Because I kept reviewing my notes on the WCIYP process through the samurai notebook process, I kept my lens and inspiration clear. 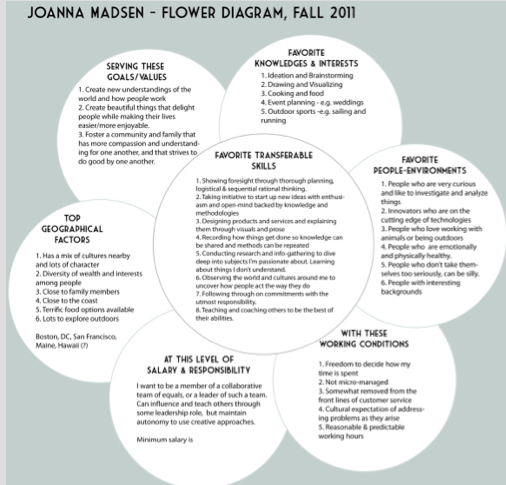 Here is an excellent example of a career flower from a blog called Quantified Self. Doing the flower is great even if you are not switching careers because it helps you clarify where and how you want to be. Take time to smell the flowers. The WCIYP process asks career seekers to begin by creating several petals on their “flower”: favorite knowledges, kinds of people to work with, favorite transferable skills, preferred working conditions, salary and level of responsibility, preferred places to live, as well as a statement of purpose or mission in life. 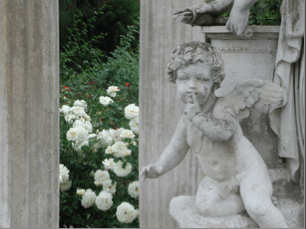 Making the flower involves both inner work and research. Once you’ve finished making your flower, you have created a powerful tool that empowers you to make a more enlightened job search. Learning to learn skills. Books and programs about how to learn and develop talent. I put my “flower” on googledocs but I soon realized that just leaving it there would be just like archiving it. During my morning reviews, I spent a little time putting the “petals” into my plain old notebook. This ensured that I would keep rubbing against all of these ideas during my day to day life and as I considered different options.